We all hate outages. At Southwest TN EMC, we continuously invest in industry best maintenance practices and system improvements in a attempt to minimize loss of power to our members. Yet outages still occur from time-to-time. 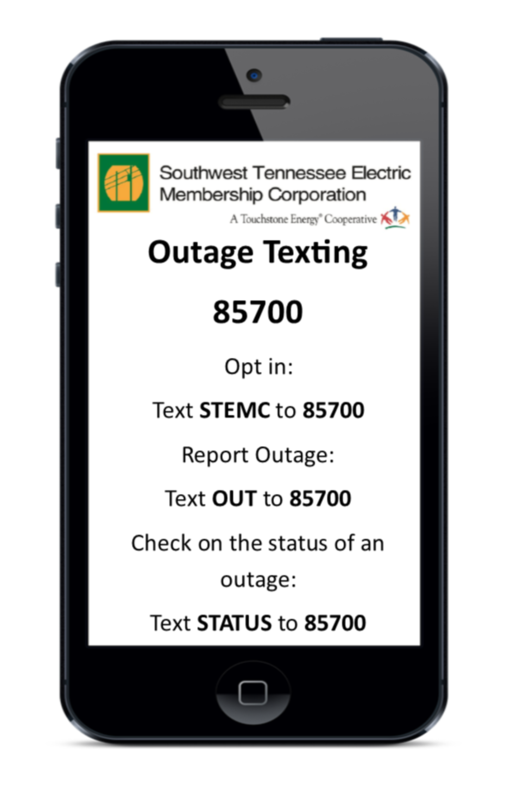 In an effort to provide more efficient ways to communicate, STEMC now offers a Texting Outage Notification System. Members can now report outages via text message. Through this system STEMC will notify members, who opt-in via text, when outages occur in their area and when power is restored. Whether you report outages via phone call or text it is very important to make sure STEMC has a valid cell phone number on your account. To update, please call your local STEMC office. The system will update overnight & you may opt-in to the outage texting notification system the following day. Save 85700 as a contact in your phone. Text STEMC to 85700 to opt-in. after the system updates within 24 hours. STEMC will communicate that the outage is received and send a link to our outage map.